It is clear that the political cover – the Arab Spring – and the premeditated support of terrorist groups including Al Qaeda brought in afterward, were planned years before the Arab Spring actually unfolded in 2011. The goal was admittedly the overthrow of governments obstructing Washington and Wall Street’s hegemonic ambitions and part of a much wider agenda of isolating, encircling, and containing Russia and China. The destruction of the MENA region was intentional, premeditated, and continues on to this very day. Since 2011, each and every one of the West’s “color revolutions” has predictably devolved into armies of US-backed terrorists attempting to divide and destroy each nation. In Libya, this goal has already long-since been accomplished. In Egypt and Syria, with varying degrees of failure, this agenda has been stalled. Egypt through sheer virtue of its size and the capabilities of its military, has prevented nationwide warfare. In Syria, facing invasion primarily from both Turkey and Jordan, violence has been far more dramatic and enduring. But despite initial euphoria across the West that their insidious conspiracy had indeed upended the MENA region entirely, Syria’s ability to resist the West’s proxy forces, and now, more direct intervention, has entirely disrupted this wave of regime change. US Senator John McCain (Republican – Arizona) who literally posed for pictures with terrorist leaders in both Libya and Syria, including the now head of the so-called Islamic State (ISIS) in Libya, Abdul Hakim Belhaj, at the height of the Arab Spring prematurely taunted Moscow and Beijing with threats to bring similarly US-orchestrated chaos in their direction. Suffice to say, Moscow and Beijing were not only ready for this destabilization, they were prepared to foil it before it so much as reached their borders. And as momentum stalled, the US and its regional collaborators attempted to justify direct military intervention in Syria first as they did in Libya – by claiming they would be averting a humanitarian disaster and assisting “freedom fighters.” However with the crimes the US and NATO perpetrated in Libya still fresh in the global public’s minds, this narrative was entirely untenable. Staged chemical weapon attacks were perpetrated on the outskirts of Damascus, under the nose of UN inspectors in a bid to frame the government of Damascus and again justify direct US military intervention against Syria. Again, the global public, recalling similar fabrications peddled by the West ahead of its ten year invasion and occupation of Iraq along with expert diplomacy by Moscow, averted war. And while it is increasingly obvious that Al Qaeda and ISIS’ presence in Syria and Iraq is the direct, premeditated result of US-NATO and their regional allies’ sponsorship of both groups, the West has attempted to use them as a pretext for direct military intervention not only in Syria, but again, against the government of Damascus itself. As this last attempt to justify a final push toward regime change in Syria falters, and as European powers begin deciding whether or not to intervene further in Syria alongside the US, a sudden and convenient deluge of refugees has flooded Europe, almost as if on cue. Scenes like that out of a movie showed hordes of tattered refugees herded along various borders as they apparently appeared out of what the Western media has portrayed as a puff of smoke at Europe’s gates. In reality, they did not appear out of a puff of smoke. They appeared in Turkey, a NATO member since the 1950’s and one of America’s closest regional allies. Turkey is currently hosting the US military, including special forces and the CIA who have, together with Turkish military and intelligence agencies, been conducting a proxy war on neighboring Syria since 2011. Turkey is now the world’s largest recipient of refugees. Since October 2013, the number of Syrian refugees has increased more than threefold and now numbers almost two million registered refugees. The cost has been high to Turkey. Government officials are quick to point out that they have spent over $6 billion on the refugees and complain about the lack of international support. Brooking details the vast efforts Turkey is undertaking in coordination with Western NGOs to manage the refugees. There is little way that these refugees could suddenly “disappear” and end up in Europe without the Turkish government and more importantly, European governments either knowing about it or being directly involved. Clearly Turkey lacks any altruistic motivation behind its refugee policy. Turkey is one of the chief facilitators of terrorists operating in Syria, and a primary collaborator in NATO’s proxy war against its neighbor. Turkey has allowed literally hundreds of supply trucks a day to cross its borders uninhibited and destined for ISIS territory. 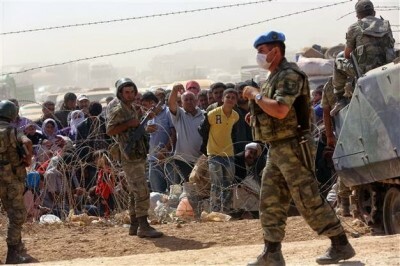 Turkey has also been tasked throughout various US policy papers with establishing a “buffer zone” or “safe haven” to move these refugees into, as well as for establishing a Syrian-based stronghold for NATO’s terrorist proxies to launch military operations from. Likely, the refugees were to serve as the initial population of whatever proxy state NATO planned to create with territory it seized and established no-fly-zones over in northern Syria. 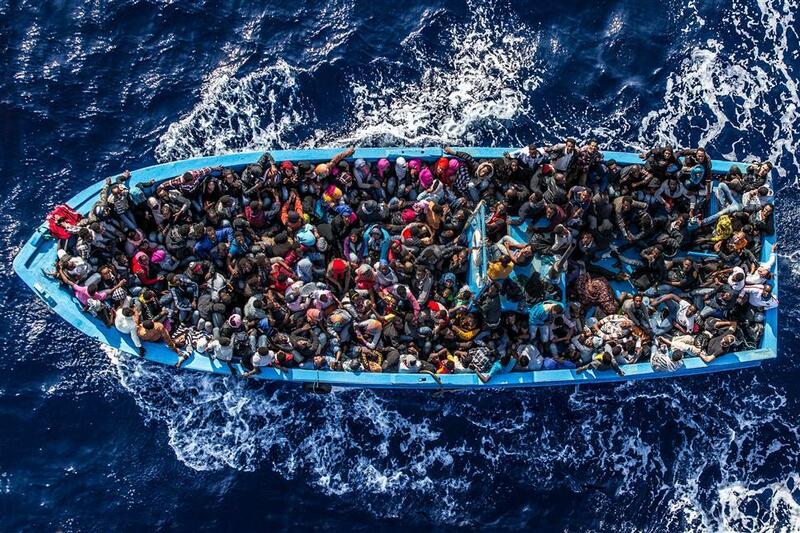 Now it appears many of these refugees are instead being rerouted to Europe. However, not all of the refugees flooding into Europe from Turkey are even from the Syrian conflict. Many are being trafficked first to Turkey from other theaters of NATO operations, including Afghanistan and Pakistan as well as Iraq. It appears that Turkey is serving as a central transit point, not just for terrorists it is feeding into the Syrian conflict, but also for collecting refugees from across MENA and Central Asia, before allowing them to proceed in vast numbers to Europe. A sharp increase in the influx of migrants and refugees, mostly from Syria, into Greece is due in part to a shift in Turkey’s geopolitical tactics, according to diplomatic sources. These officials link the wave of migrants into the eastern Aegean to political pressures in neighboring Turkey, which is bracing for snap elections in November, and to a recent decision by Ankara to join the US in bombing Islamic State targets in Syria. The analyses of several officials indicate that the influx from neighboring Turkey is taking place as Turkish officials look the other way or actively promote the exodus. Catastrophes that are meant to look “sudden” and “unexpected” as well as “unstoppable” but are in fact, allowed to unfold within an operational theater completely controlled by the US and NATO constitutes instead a conspiracy – pitting desperate and/or exploited refugees intentionally sent out of Turkey and into Europe, against a manipulated, fearful, and ill-informed Western public. Also brought into sharp focus, are the string of staged attacks allowed to unfold across Europe – allegedly the work of “ISIS.” In every case without exception, the perpetrators had been well-known to Western intelligence agencies, including the shooters involved in the Paris “Charlie Hebo massacre.” In that incident, all members involved were tracked by French security agencies for nearly 10 years. At least one member was even imprisoned, had traveled afterward to collude with Al Qaeda abroad, and returned to Europe, all while under surveillance. “Coincidentally,” for the 6 months needed to plan and carry out their final act, French security agencies stopped monitoring the group, claiming a lack of resources to do so. Those familiar with NATO’s Cold War Gladio program can see clearly that the attacks were staged to play into a strategy of tension used to produce fear domestically and build up support for wars abroad. The recent refugee crisis is being used for precisely this same purpose. In fact, while a false debate is being managed by the Western media and Western political figures to either unconditionally accept the refugees or unconditionally reject them, the only singular narrative both sides are being made to agree on is that instability across MENA is to blame and more bombing is the answer. The main narratives undulating media headlines dismiss both the West’s role in devastating the MENA region, as well as acknowledging the fact that the “refugee crisis” is emanating primarily from within NATO’s borders, not from beyond them. The refugees are pawns, intentionally moved across the game board to illicit a predictable reaction from their hopelessly unskilled opponents – the public. While the social engineers are engaged in a game of three-dimensional chess, the Western public appears to be infantilely eating their checkers. Considering this unfortunate reality, whatever justifications the West is able to predicate upon the refugee crisis will have to be confronted again by Syria and its allies alone – with the Western public hopelessly defenseless against a conspiracy they have been made accomplices of. A refugee crisis was inevitable, regardless of the timing and magnitude of any given deluge that may have been created or manipulated by the West. Destroying the planet in pursuit of empire, pillaging nations and hauling away the wealth of the world, inevitably leads to endless streams of victims following their stolen wealth back to the thieves’ den. As an empire expands and the list of its victims expands with it, the number of those an empire is able to fully assimilate versus those who will inevitable overwhelm it eventually tips the balance against the empire’s favor. Such was the fate of the Roman Empire, which over the course of its decline, had its institutions overwhelmed by peoples it had conquered faster than it could assimilate them. For the West, it has chosen confrontation rather than cooperation. It has closed economic ties with Russia, alienated China, and wages ceaseless war across the MENA region and Central Asia. It pursues a now exposed campaign of divide and conquer across Southeast Asia augmented with terrorism and political subversion all while neglecting every virtue that ever made it a respected global power to begin with. How much of the most recent refugee crisis is social engineering versus simply the inevitable rot of empire is difficult to tell – though the fact that social engineers would be tempted to use a vast number of refugees created by their own foreign policy indicates that their ploy in and of itself is indicative of immense, irreversible geopolitical rot.